ConeFire Mode – Allows you to easily program the kiln based on the cone value and whether it is a bisque or glaze firing. Now it is faster than ever. An easy to edit screen lets you quickly change parameters from the last firing and start the program. You can also view the actual segments in the program and display a graph of the firing. Program Library – We have added a program library with helpful programs for unique processes like Slow Sculpture, Steven Hill Single Fire, and Cone 5 Crystal Glaze. So Much More – To find out more detail about the new KilnMaster Touchscreen Controller, see below. For a quick look at the features of the new Touchscreen Controller view or download the information sheet. View or download instructions to link your KMT/GMT kiln(s) with the Free KilnLink App. 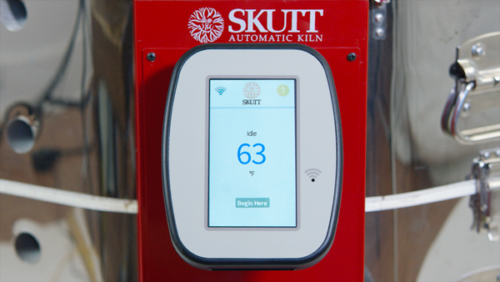 If you are retrofitting an existing kiln with a new touchscreen controller (KMT/GMT), view or download the step-by-step upgrade instructions. This video walks you through the programming steps for entering a ConeFire program.